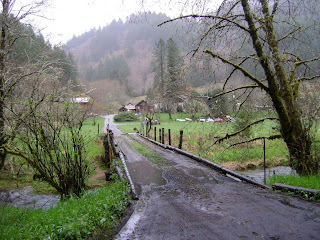 Highway 36 is an old artery that connects the Oregon coast to the fertile farm lands of the Willamette Valley. The winding two lane highway lies in a gorge that's cut through the Coast Mountain Range by the Siuslaw, a now gentle river that's been known to rage and flood on whim. The length of the highway is peppered with dying mill towns. The general stores and post offices in these communities are now boarded and the cottages of the remaining residents are gradually succumbing to neglect and creeping Oregon damp. There's a part of the highway - the stretch that runs from Swiss Home to Deadwood - that sits on some of the most beautiful land in the state. The steep canyon walls are verdant and their green hues highlight the rushing white water of the shallows below. Here and there you'll find a town that has survived. Deadwood, population 502, is one of them. There are some prosperous ranches in the valley that runs alongside Deadwood Creek and at mile marker 7 - the means by which distance is measured in these parts - you'll find the 285 acres that support the well-known Alpha Commune, an intentional community that has survived the vagaries of fad and fashion and remains intact, true to its original charter. There'll be more about the Alpha community and their kitchen in weeks to come. For now I want to take you back to the Deadwood general store where coffee is free and the conversation warm and inviting. Free coffee. Imagine that. Because we are often in the area to harvest ramps and fiddleheads, I wanted to find a way to thank these folks for their hospitality. Today's "real" coffee cake is my way of doing that. The next time we head down Highway 36 the cake will come with us. The recipe was developed by Maida Heatter. 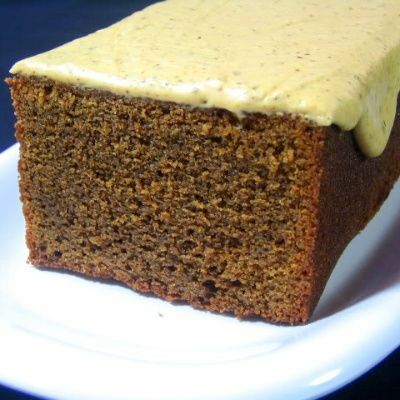 It's a lovely cake, strongly flavored with coffee, and it's very easy to make. I normally glaze it with melted chocolate, but I thought the mocha icing would make a better photograph. I prefer the chocolate glaze. I hope you'll try this European-style loaf cake. 1) Adjust a rack to lower third of oven. Preheat oven to 375 degrees F. Generously coat a 14 x 4 x 3-inch loaf pan with butter. Dust with flour. A nonstick baking spray may also be used. 2) Combine milk and coffee crystals in a small saucepan. Heat, stirring to dissolve crystals. Set aside to cool. 3) Sift flour with baking powder and salt. Set aside. 4) Cream butter in the bowl of an electric mixer. Add vanilla and sugar and beat for 2 minutes. Add eggs, one at a time, beating well after each addition. Beat for 1 to 2 minutes at high speed after adding last egg. Mixture will look curdled. It's not a problem. 5) With mixer on low speed, add flour in three additions and milk mixture in two. Beat only until smooth. Turn into pan. Spread until level, then use a spatula to move batter slightly up the sides of pan, leaving center slightly lower than sides. 6) Bake for 55 minutes or until a cake tester comes out clean. Cool in pan for 15 minutes. Invert on rack and remove pan. Ice cooled cake upside down. 1) Combine butter, sugar, coffee crystals, egg yolk an 1-1/2 tablespoons boiling water in a small bowl. Beat until smooth and spreadable. 2) Spread over top of cake. Some icing with run down the sides. Let it be. Yield: 8 to 10 large slices. For those who would prefer chocolate with their "coffee" cake, here's a recipe for a chocolate glaze. 1) Melt chocolate and butter in a small bowl set over simmering water. Add corn syrup and milk and beat until smooth. 2) Remove from heat. Cool slightly. Pour warm glaze over top of cake, smoothing top but allow drips to remain on side of cake. Let set for a few hours before serving. Cook's Note: Two 8 x 4 x 2-1/2-inch amay be substituted for the larger loaf pan. This cake does not store well. It dries out quickly. I love the imagery this post evokes. I can just picture the small towns and the greenness of it all. Now you're making me homesick. You are such a nice lady, always willing to share whatever you cook. God bless you. Don't you wish more places were like that! How lovely of you to bring the cake -- it looks delicious!! Mary- I would love to try this as I am a true coffee lover. Was wonderng what coffee you used. Would any coffee do, such as Dunkin Donuts? Id love it with the chocolate glaze better too I think. I made an espresso coffeecake and it was tasty -- this sounds really good. Love coffee in the food as well as in the cup! Mary, you have the best stories and the most beautiful food. You are so talented and I hope I get a change to try this bread real soon! I love the off the beaten paths of our beautiful state. I'll have to drive down your way one of these days. Lovely cake. I know I would enjoy this coffee flavored cake. I've been through that area, but it was years ago. It left such a wonderful impression on me and your writing brings those memories back. The coffee cake look wonderful too. I will bring one to my next ladies coffee gathering. You are so awesome...I felt like I was in a book for a moment there. I'd love to go looking for fiddleheads here! Mary your cake looks great love all the coffee. Looks great. Donna, I use Folgers coffee crystals because that's what I had on hand. I'm going to go back into the post and add the recipe for a chocolate glaze. I am a big fan of coffee cakes, but unfortunately I do not make them that often since I would be the only one eating it! I would have to share it as well. Mary your coffee cake looks delicious. I like the idea of the chocolate icing too. It's really too bad about all those little towns. This may be happening more and more. I love the character of those little towns. I would really like to try this recipe. It sounds very tastey and looks like it has a nice texture. I love the story! I love little places like that with so much charm and kindness. They'll love your cake! They will love the cake, I am sure. It sounds wonderful and the chocolate frosting tops it perfectly. Looking forward to trying this recipe out. I kept wanting to read more!! I could picture myself there. The "Coffee Cake" looks beyond incredible. I definitely want to try this! Thank you so much for sharing and wonderful photos. Hi, Ginger. It's always best to leave folks wanting more. I promise there'll be more over the next few weeks. The coffee cake recipe looks delicious and one that I will try. I do have a question. What if you use salted butter instead of unsalted butter? Actually, I accidentally bought a pound of salted butter and don't know what to do with it. Sweetie, go ahead and use the salted butter. Cut back the salt called for in the recipe from 1/4 teaspoon to 1/8 teaspoon. Your cake look absolutely delicious! The mocha frosting sounds great. Lovely story Mary. So scenic and picturesque too. The cake does sound very "real" and sooo homely. I must admit I was a little taken aback to see an egg yolk in your icing. I have never seen that before. Have I been living under a rock or something? Mariana, this is an old recipe. Younger recipe developers and therefore newer recipes don't like to use raw eggs in the preparation of food (they are afraid of Salmonella). I use pasturized eggs so this is not a concern to me. Thank you for explaining Mary. I do make a garlic mayonnaise with free range egg yolks, but icing! Still quite can't get my head past that one. Mariana, I'm back again. In this recipe the yolk is used to make the frosting a bit more creamy. There is, however, an absolutely delicious cake frosting made with egg yolks and sugar syrup. I've always called it French buttercream. There are recipes for it on the internet. Free coffee! Now if only we could all sample this cake for free--it looks divine, and I love the glaze on top :). Sophie, I'm so glad you stopped by. I hope you'll come again. This looks wonderful. I wish my husband liked a strong coffee flavor as much as I do. Just wanted to say that I tried out this recipe the day after I found your blog. It was an instant hit with my family and grandmother. So thanks. I'll most likely try more of your recipes. Ironically, my name is also Mary. Came across your site on Tastespotting and very happy I found this cake. I love love love coffee flavored desserts and your photo makes the cake look so moist! Gonna try and see if I can do as good a job tomorrow! Saucy coq, I'm so glad you found us. I hope you'll visit often. This recipe is a winner.... the procedure is simple and the result mouth watering. Try this success recipe and win people's hearts! I have been looking for a recipe like this... thank you! can not wait to try it. great recipe! making it right now for the second time. it's easy and delish. Just wanted to say that I made this cake yesterday for my birthday, and it was the best cake I've ever made. I left out the icing (as we don't have a huge sweet tooth in my family) and added a handful of walnuts and it was absolutely delicious - the texture was gorgeous and the after-taste, always a risk with cakes, was lovely. Thanks so much. Would it be okay to use a milk substitute (almond milk?) This recipe looks so delicious.